Are Social Media Certifications Worth It? 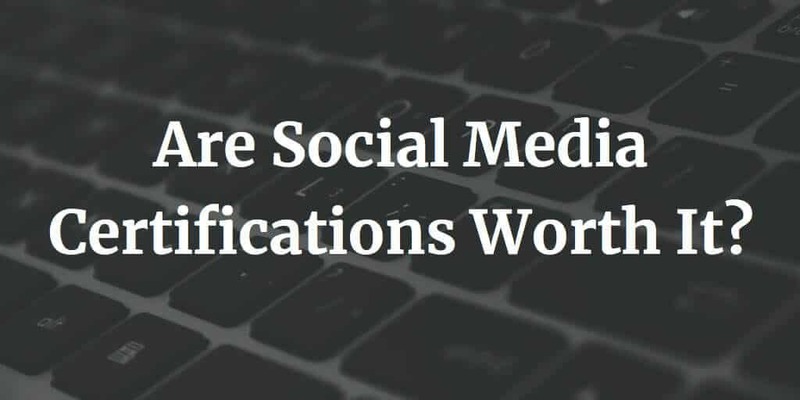 Home » Social Media » Are Social Media Certifications Worth It? Social media marketers and those looking for a job in the field often ask, “Are social media certifications worth it?” Here’s my take. As social media has grown in popularity, so have the number of companies willing to offer you social media certifications. Don’t bother. There are far better places to invest your time and energy, which will be more useful and look better on your resume. Google Analytics and AdWords Certifications are a far better investment than any social media certification. Where most social media certs focus mostly on the product, Google Analytics and AdWords are mostly about digital analytics and paid-per-click theory and strategy. Understanding of these areas are critical to successful social media programs and well-rounded digital marketing strategy. Analytics knowledge is required to understand Facebook Insights or Twitter Analytics. Paid advertising knowledge is required to run successful Facebook or Twitter ads too. The education you get from these two certifications will serve you far beyond the single platform most social media certifications cover. As someone who has run social media programs for Fortune 500 companies, I can say I’ll hire someone with a Google Analytics or AdWords certifications every time over someone with HootSuite certification. I’ve never seen a job posting that required social media certifications but countless require those from Google. As an added bonus, Google Analytics and AdWords are free to take. Far better than the $199 or more some charge for theirs. Most social media certifications are a waste of time and money. If they’re free and you’re already Google Analytics and AdWords certified, they might be a nice add-on. But don’t expect to get any job offers because of them. Smart marketers will put their time into certifications that matter, then continue educating themselves on continued strategy and optimization. Tools are generally far easier to learn and pickup. Great understanding of successful strategy will take you much further. Invest wisely.